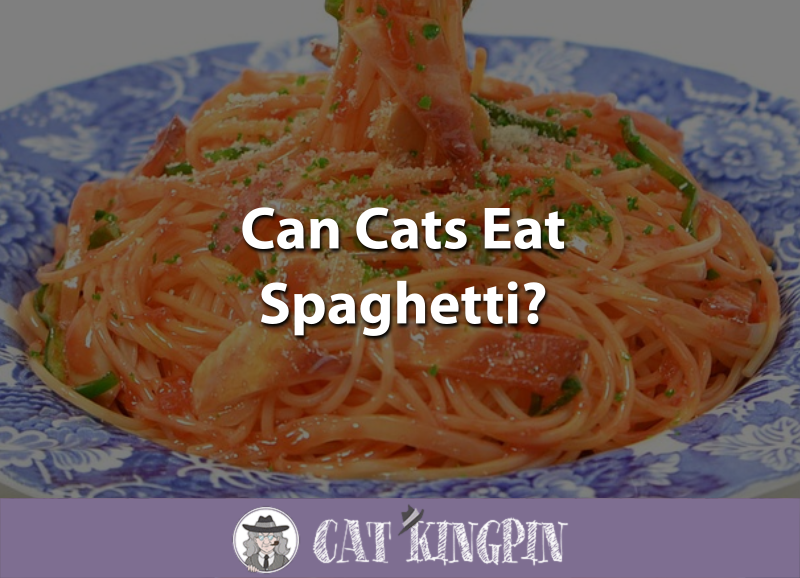 » Can Cats Eat Spaghetti? Originally exclusive to Italian cuisine, spaghetti has become a popular dish around the world. If you’re eating spaghetti at home, you may notice your cat paying attention to what’s on your plate. While there is a host of human foods that are fine to share with our furry friends, not all “people food” is safe for cats. Can cats eat spaghetti? Spaghetti falls into the rather broad category of “sort of.” While it’s unlikely to do your cat any harm, there are few nutritional benefits to feeding your cat spaghetti. If you sneak your cat a piece of spaghetti now and again, there really isn’t anything to worry about. The biggest danger with spaghetti is what accompanies it: pasta sauce. Most pasta sauces contain ingredients that are unhealthy or downright poisonous to cats such as onion and garlic. The base ingredient of pasta sauce, tomatoes, in and of themselves are acidic and can cause digestive upset in cats. If your cat fills up on carbohydrates, they’ll be less interested in their commercial cat food which contains all the proteins vitamins and minerals they need to stay healthy. Be sure to feed your cat a high-quality food such as Merrick Purrfect Bistro, which is grain-free and lists meat as the first few ingredients. When wondering whether or not a certain food is safe and healthy to give to your cat, the first question you should ask is: is it protein? Cats are carnivores and so the majority of their diet should be made up of animal-based protein. Despite their meat-eating tendencies, many cats enjoy a taste of something a little bit different now and then. There are plenty of fruits and vegetables that are healthy for cats, and then there are human foods that aren’t necessarily detrimental to kitty health but aren’t a healthy choice either. Pasta is one of these foods. Before you start reenacting that scene from Lady and the Tramp with your cat, it’s important to keep in mind that pasta has almost no nutritional benefit for cats. It’s almost entirely made up of carbohydrates and contains almost no protein. While cats do need some carbohydrates in their diet, they require far less than humans do. That being said, if your cat really seems to like pasta, you shouldn’t have anything to worry about unless they’re allergic to wheat. You really shouldn’t give your kitten spaghetti. In fact, the vast majority of human foods don’t belong in your kitten’s food bowl. Kittens are growing rapidly and undergoing important physical and mental developments. Kittens are best served by being fed a diet comprised solely of a high-quality kitten food with no fillers, only high-quality grains, and meat listed as the primarily ingredient such as Wellness Core kitten food. If you want to offer your kitten a little something extra as a treat, lean, plain proteins such as small pieces of chicken breast or deboned and cooked fish are a much better option than carbohydrate-laden foods such as spaghetti. Plus, if you get your kitten used to eating human food when they are young, they may be resistant to eating cat food as adults and can quickly develop into picky eaters. This cat seems both confused and interested in spaghetti. And because it doesn’t have any sauce, it probably won’t do him any harm. Spaghetti, while delicious, contains pretty much zero nutritional benefits for cats. If your cat really enjoys a plain cooked piece of spaghetti, you can offer it to them with the knowledge that it should only be considered a treat and shouldn’t make up any significant portion of their normal diet. Raw spaghetti can actually post a choking hazard for cats and can be problematic if swallowed. For this reason, it’s important to only offer your cat plain cooked spaghetti. This cat is eating a small portion of plain spaghetti, at the dinner table, no less! Because spaghetti tastes pretty bland, it’s unlikely the flavor that your cat fines enticing. The soft, chewy texture of spaghetti is likely the selling point for your feline friend. If you’re looking for some human food that you can share with your cat, you’re better off giving them a tiny bit of chicken, peas, or tuna, all of which have at least some nutritional value. So, can cats eat spaghetti? Unless your cat has a wheat allergy, plain spaghetti (no sauce!) is unlikely to do your cat any harm. However, it’s important to remember that spaghetti is nutritionally useless for cats. If you’re looking for a tasty treat to offer your cat as a reward, skip the spaghetti and offer them commercial cat treats, such as MeowMix Irresistibles, or human foods that are tasty as well as nutritious.